We manufacture quality Bottle Sticker labelling machine or self adhesive labelling machine used to wrap around the bottles and containers it is an automatic machine you have to place the container on the turn table and the same moves through conveyor to label dispensing unit and after that label is pressed around during moving on conveyor. Dual side labelling machine is also available for flat bottles. 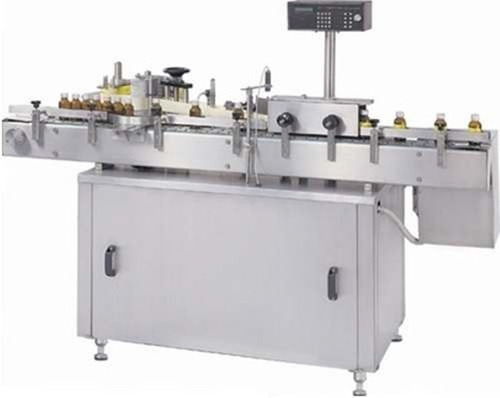 Automatic Bottle Sticker Labeling Machine is extensively used for full/partial wrap around labeling on diverse size of round containers. Competent of labeling up to 150 containers per minutes, the machine is offered as per the products and label size. Perfect for labeling on round bottles, vials and other round objects. Established in the year 1995, Riddhi Pharma Machinery has created a market for its self as a manufacturer and exporter of precision engineered products that are extensively used in the pharmaceutical industry. Our multitude of products include Pharmaceutical Machinery, Tablet Press Machine, Rotary Tablet Press Machine, Fluid Bed Dryer, Mass Mixer, Planetary Mixer Machine, Tablet Compression Machine, Double Rotary Tablet Press, Single Rotary Tablet Press, Blister Packaging Machine, Multi Mill, Colloid Mill, Strip Packaging Machine, Tablet Coating Machines, Tube Filling Machine and Container Filling Machine Triple Head. Our machines are used in the Tablet , Capsule, Liquid, Ointment, & Injectable Section in the pharma industry. With our unmatched product range made from quality products we are about to get ISO 9001 certification that will further coin our claims. Since our inception we have installed around 400 machines in a number of pharmaceutical industries around the world. Our repertoire of clients spread across the globe speaks volumes about our market share. This has only been made possible because of our world class infrastructure and efficient and qualified team of workers. With all of the above factors playing a major role in our successful endeavors the other factor that has made contribution in our huge market share is the pricing of our products. Cost effective products combined with on time delivery is the key to our unmatched success.